To identify the version of Android you're using follow the instructions provided in this document. Google periodically releases updates to the version of Android available to manufacturers of Android devices and some applications may have operating system requirements that you may want to check before you attempt to install. This document explains how to identify which version of the Android firmware a device is using. Go to your Home screen and click on Settings. Scroll down and click on About phone. If you are using an HTC handset, you may need to then click on Software Information. You should then see something similar to what's shown below. The section labeled "Android version" contains the version of Android you have installed. 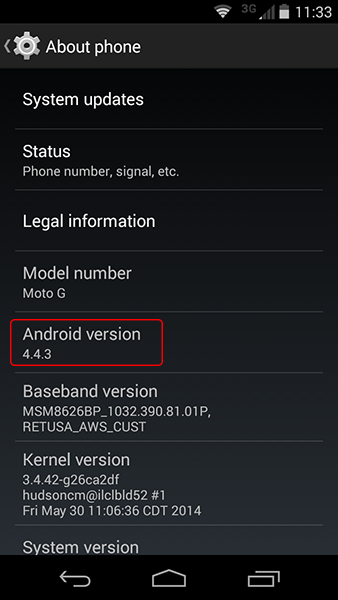 In the example screenshot, the device is running Android 4.4.3.